Life can really be wonderful, but unfortunately, life sometimes brings us hardships. Some people face more difficult hardships or traumas than others, just as some people deal with those traumas better than others. Learning how to deal with that trauma and heal afterwards can be difficult, but there is hope, and that is important to remember. You would be amazed what your brain is capable of, one of those things is healing and recovering from traumatizing hardships. It is important to realize that one cannot repress and forget the feelings that come from a traumatic experience, but the only way to heal is to face those feelings and deal with them head on. If you don’t take the time to face your post-trauma distresses, it is highly possible that it could lead to post-traumatic stress disorder, which will be even more difficult to overcome. It is important to not repress your feelings or hide yourself from others, but to directly face your feelings and hold on tight to your relationships in life that give you strength. 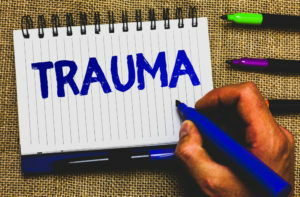 Whether your trauma is a divorce, the death of a loved one, falling ill, or even experiencing events such as natural disasters or war, there are typically several stages of recovering from a trauma. With this overload, your body shuts down in a way, you go on in a zombie state of mind and you may feel hopeless like you may never feel like you again. The good news is that you can feel like you again, you just must hold on to any positivity you can find and stay hopeful. Once your system begins to reboot, you will start to feel more stimulated and energized, your body is trying to recover from the initial shock it endured. The third stage involves taking steps and actions to tangibly help the situation. This psychologically gives the person a sense of control over the situation that occurred and helps overcome that feeling of powerlessness. The actions you can take will of course be dependent upon your situation. Perhaps if you lost a love one, you can take action in their memory, from painting a picture to donating to a cancer foundation. You can reach out to someone or a group who has also experienced similar traumas. It is in this stage that you can become stronger. You begin to heal and while your scar is never forgotten, you discover a better, stronger, smarter you that is able to think and feel on a deeper level. This is part of “physical therapy” for the soul, just like physical therapy for an injury, it must be addressed or it will instead become weaker. Take the opportunity in this stage to become a better you and discover a new appreciation of life. It isn’t always easy to know how to recover from a traumatic experience, and most people need help and encouragement along the way. If you are struggling to get back on your feet, consider speaking to a trauma therapist in Carrolton. Here at Lifeworks, we want to help. Our caring and expert team of counselors knows the right steps to be taken to get you on a path of healing. Please, don’t hesitate to contact us today for an appointment.